Hi-Power Spec R mufflers are designed for no compromises whilst still maintaining a reasonable noise level for street use. In the pursuit of absolute efficiency, a one piece design was utilized and titanium was chosen as the preferred material due to it its incredible lightweight properties and durability against the weathering and long term use. Hi-Power Spec R mufflers are on average 65% lighter than the manufacturer’s standard muffler system and the single piece design reduces the inefficiencies that can be found at joints whilst allowing for the straightest possible design. The main material is lightweight and durable titanium. Each part is reviewed to lighten its weight. It achieves 65% lighter than stock exhaust system. There is no gap at flange portions because of the one piece design. 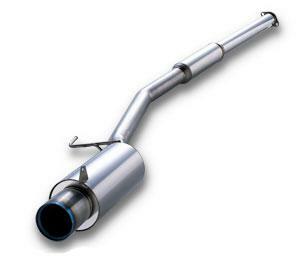 The straight structure prevents resistance against exhaust gas flow and increases horsepower. 2 layer design of tip prevents burning of bumper and has premium looking as street use model.